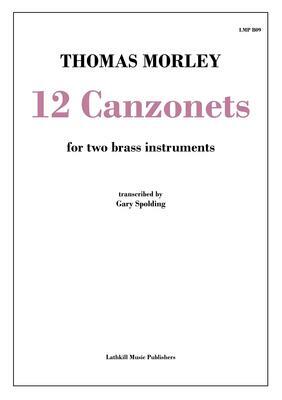 12 Canzonets by Thomas Morley from The First Booke Of Canzonets To Two Voyces (1595) transcribed for brass duo. They are not overly complex but very satisfying to play. With sumptuous Renaissance harmony and counterpoint, including hemiolas, false relations, meter changes, double suspensions and a smattering of Picardy thirds, this wonderful music lives beyond the text, and as brass duets they sound a like mini Gabrieli sonatas.